Ever since I got my new Cricut Maker I find myself trolling the paper crafting aisle every single visit any craft store. Since I don’t really papercraft per se, there are a lot of things I see and have no clue what they are used for. So when I have a few extra moments, and sometimes when I don’t but really need a break, I’ll go up and down those aisles with their mysterious goods and read anything that really catches my eye. And sometimes I’ll buy stuff that’s on sale just because I think it looks cool. That’s totally what happened with me and about 7 rolls of Cricut Party Foil on a regularly scheduled visit to Michael’s. I had ordered some Cricut Maker that I’m using for another project (holy cow, guys, SO MUCH in the works around here!) and at first, I thought I was just seeing different colors of the same stuff I ordered from cricut.com. But looking closer this stuff was different. The packaging showed those spinny things you hang from the ceiling for party decorations and I had a pretty good idea what I could do with it myself. CONFETTI! Well, actually my first thought was another project entirely which created a whole lot of scrap party foil material which was perfect to make, you guessed it, CONFETTI! 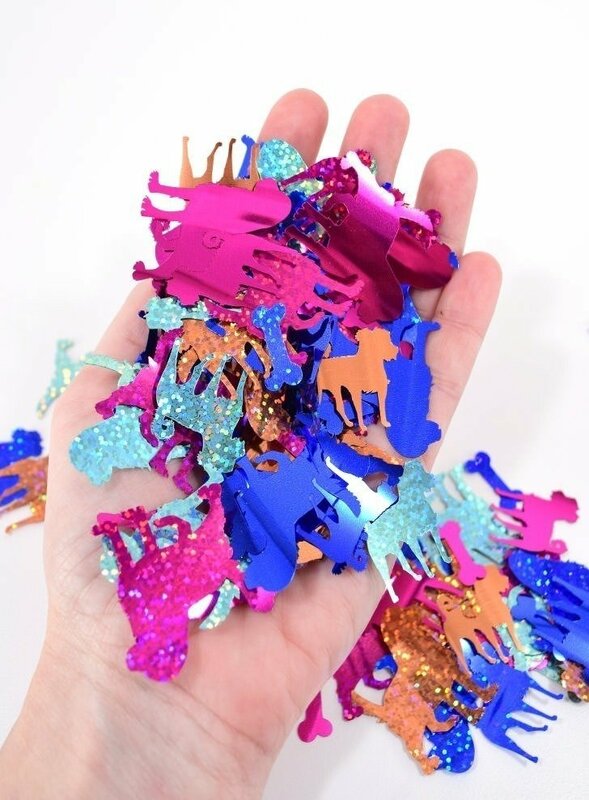 Have you ever sent somebody a card filled with confetti? I have and it’s awesome. They open the card it goes everywhere and if they’re like me they are so HAPPY! and if they aren’t so much like me they will call wanting to know why in the heck there is a bunch of junk all over their desk? Haha! Either way, everybody always seems to remember a confetti bomb in their birthday card fondly after a few years. And just think… you could totally make CUSTOM confetti to put in those cards. 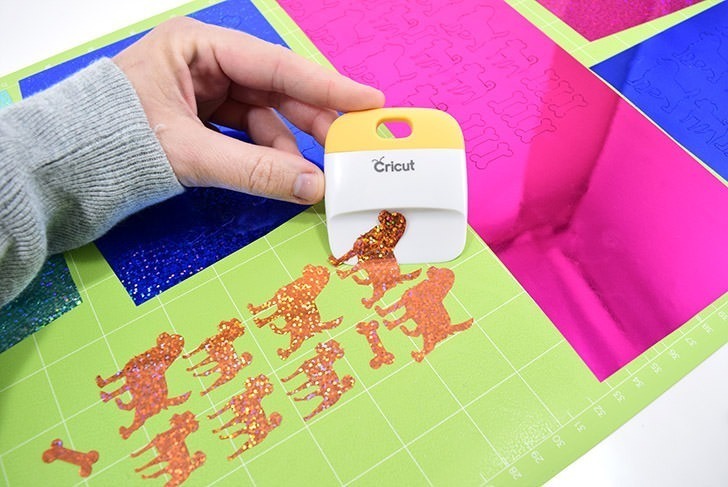 So today that’s just what we are going to do, talk about how to make your own custom confetti. 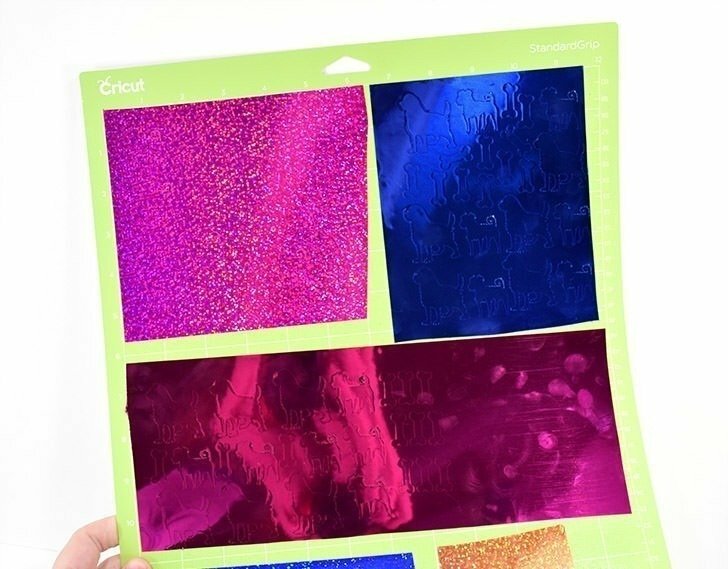 This project is especially good for using up scrap Party foil from other projects! I used an extended 24″ Standard Grip mat and stuck my pieces on making the most of the space available. Then I looked at the grid and said, the first space I can fill with shapes up to 6″ across and down to 5.5″ vertically. Then I’d fill in the space as well as possible, attach the files to one another and start on the next area. I don’t know if you can see, but I got my shape a little bit off on the blue confetti at the top right. 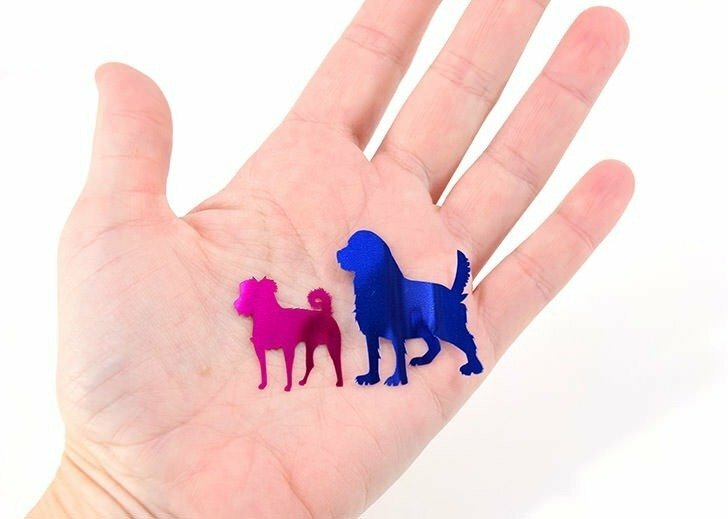 See how the little dogs are a little bit cut off? Normally I’m much better about this and that little area was the only place I made a mistake. 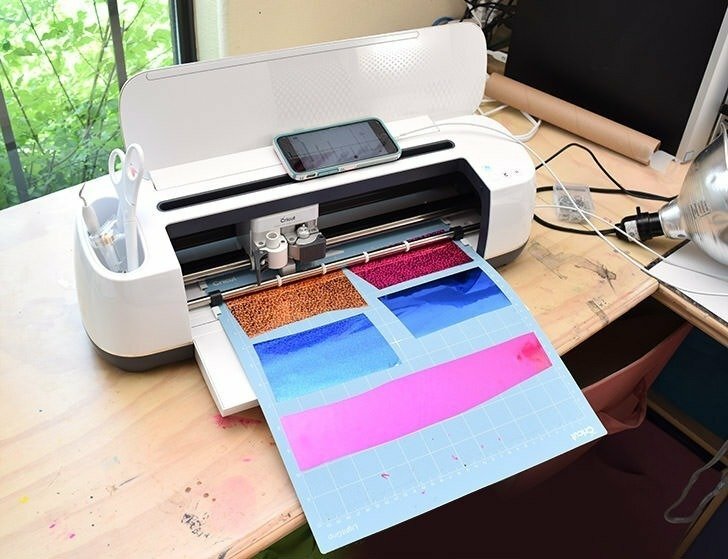 This is a great way to work when you want to use a big mat and use those scraps quickly. 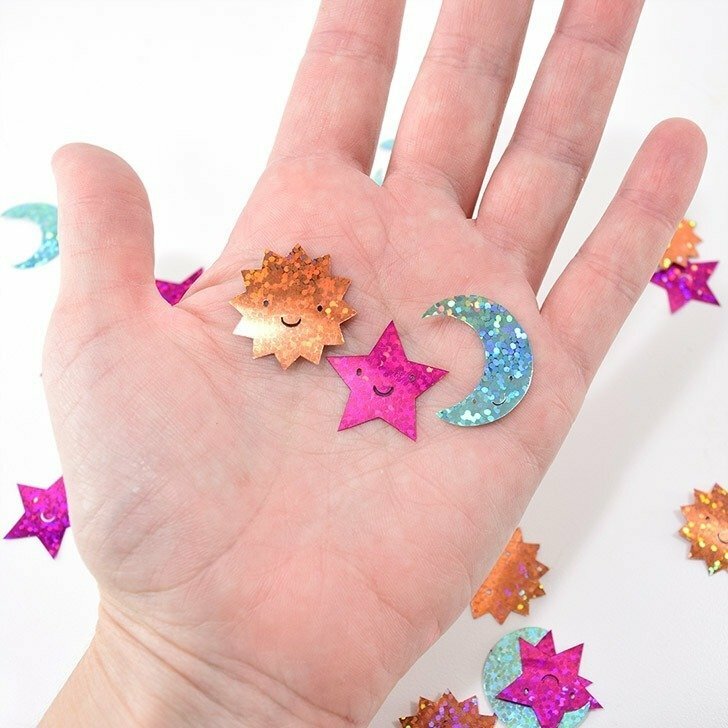 But how do you actually make custom shaped confetti in the shape you want it? 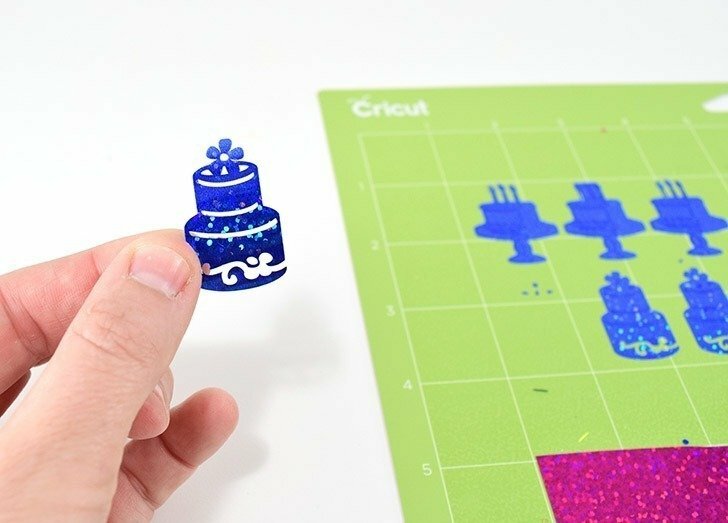 The first way is you can check out the available shapes at the Cricut Design Space. 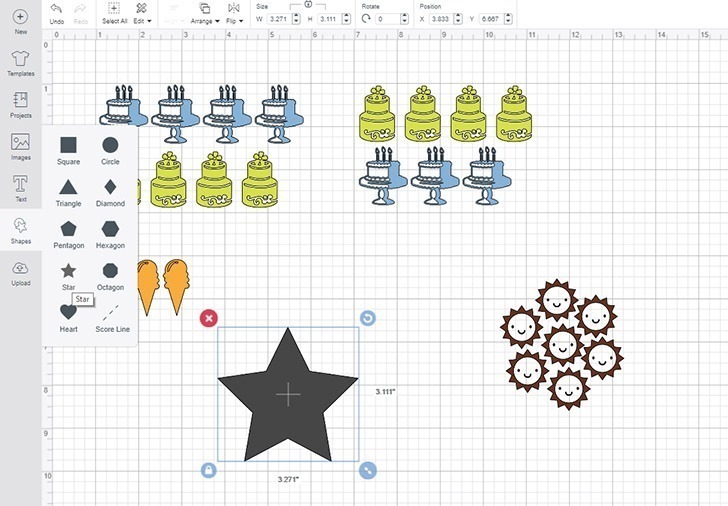 If you have Cricut Design Space Access you get, well, ACCESS, haha, to lots and lots of shapes and fonts. This is something you can purchase monthly or annually. After my free trial wrapped up, I decided to renew my access for a month because I was really happy with the files I could use in my projects for free. In Design Space, click the “images” icon in the menu on the left-hand side. In the search box in the upper right-hand part of the window, type in what you’re looking for. Filter to get the results you want. I’m using only files I don’t have to pay individually for, so I selected “Cricut Access”. Select the image you want and click the green button in the bottom right-hand corner to import it to you canvas. Because I’m using scraps I attached them to my mat and made note of where they were located. On the canvas, I resized my cake shapes and duplicated them making sure that their location worked with where my scraps are on the mat. But, wait. When I send my stuff to cut it wants to work on 2 different mats to accommodate the 2 different colors that appear in my Design Space file. And it wants to move my pieces to make the most of my material, but that’s not where my stuff even is on the mat. Cancel out and go back to the canvas. On the canvas select all of the items and in the bottom right-hand corner click “attach”. This will keep everything in the same arrangement when it comes time to cut. Continuing on to cut the file, it will move your shapes up and over to the corner of your mat so you’ll need to drag them back in place to match where your scraps are on the mat. There could be a totally much easier way to do this and feel free to let me know in the comments if there is, but this is how I managed it being a noob and all and not wanting to mess with my iPad at all. Another way to make custom confetti is to upload SVG files. 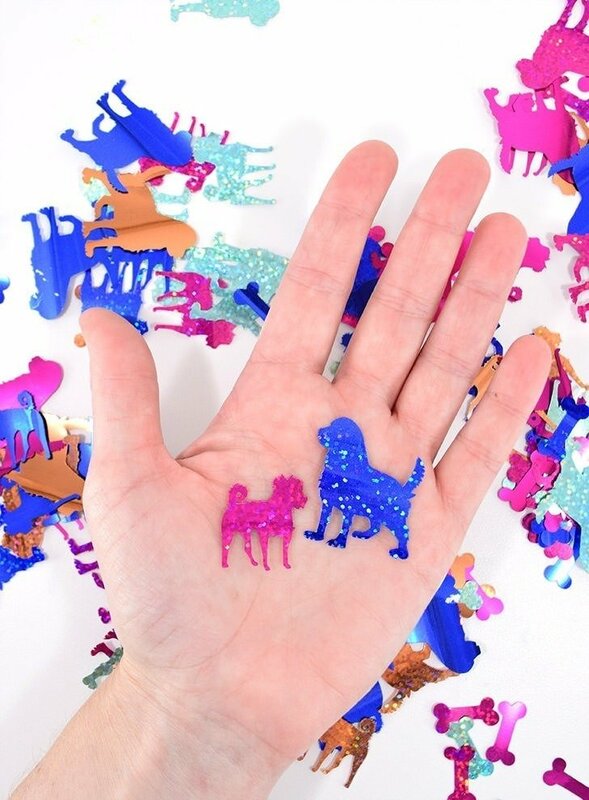 Now my little confetti pieces look just like my 2 dogs and that wasn’t by accident. I went into Adobe Illustrator and drew my shapes out myself. 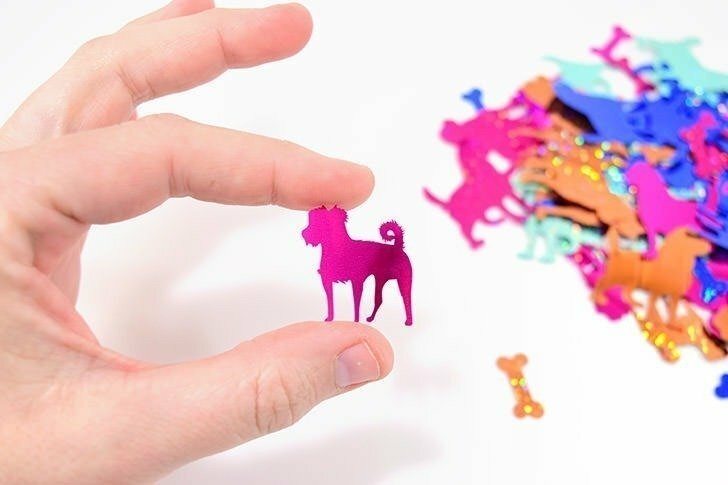 Should you decide that you want something super specific like my canine confetti but you don’t know how to create your own vector files, you can always look around services like Etsy to see if you can hire the job out. If your needs aren’t that specific, you can use free stock from the internet to make your cut files, Adobe Illustrator totally not required. Go to Pixabay and search for the type of file you want. In the search options below the search bar select “images” –> “vector graphics”. This will remove the photos from the search results and only show you those vector files that look like clip art that we’re looking for. 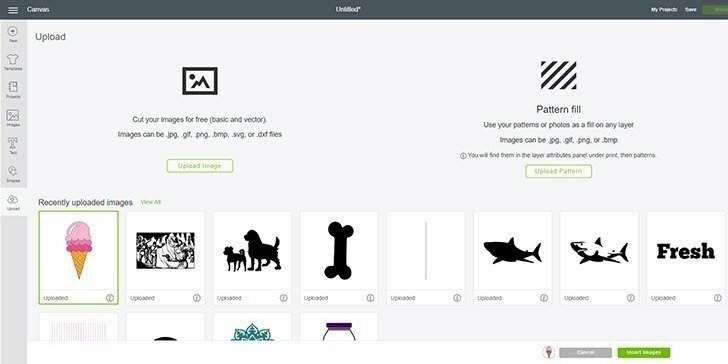 Select the shape you’re interested in and on the right-hand side click “Free Download” and select “Vector Graphic.” What you’ll download is probably an AI file. That is an Adobe Illustrator file and without that program, you can’t open it. Also, Design Space won’t import it so we need to convert it to an SVG file. Now visit Cloud Convert and upload your file(s). 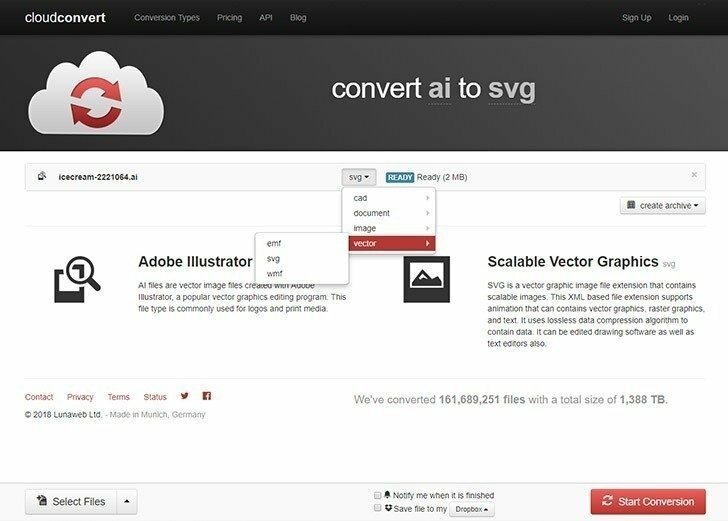 Select the file type to convert to as “vector” –> SVG. Now hit that red “Start Conversion” button at the bottom and give everything a few minutes. When the green button appears, click “Download” to grab your newly created SVG file. Be sure to save it to a location on your computer you can easily find, like My Documents or right on your desktop. 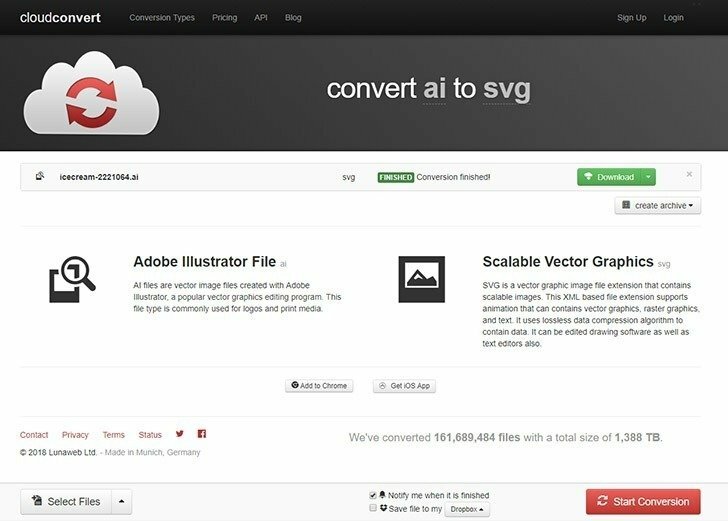 Name and tag your imported SVG image so you can easily find it later and select “save”. Click the “upload” icon in the left-hand menu and select your newly uploaded file. Click the green, “insert images” button to bring it into Design Space. More than likely you’ll have some work to do to make this a viable cut file. The image on the left has had the lines across the cone removed. It’s just going to cut those and it’s going to be a mess. Playing around with the shape, you might then notice that it is several overlapping pieces. The second ice cream cone is all of those pieces selected with “weld” selected in the bottom right-hand corner to make it one piece that will properly cut. On the right side is that welded piece with some details added on top to make it a more interesting cut file. Select all pieces of your cut file and select “attach” from the bottom right-hand corner to keep everything together. Last, but not least, if you’re looking for basic shapes, in the left-hand menu of design space select “shapes”. 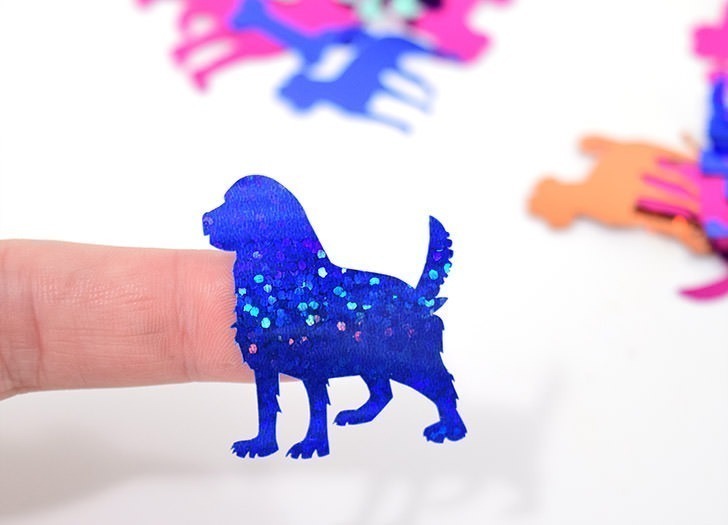 There you will find various shapes you can use and cut simpler confetti pieces with. Add little faces to simple star shapes and look, cute smiling stars! 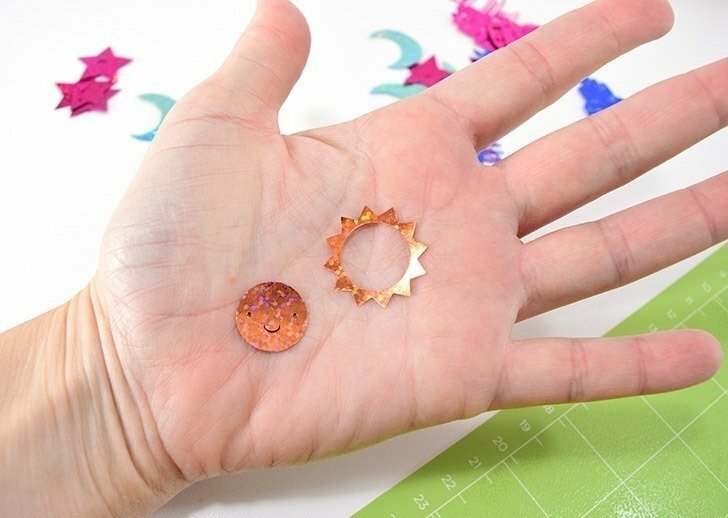 Once cut, the easiest way to remove your confetti is to peel up the large surrounding section first. Grab a scraper (I’ve actually got the big one on order which will be even faster!) and gently slip it up under the confetti pieces and pull them up and away. Areas that are small, like around the tail on the smaller dog’s body, you’ll need to be careful because you can accidentally rip it off, especially if, like me, you’re using a newer mat that’s still uber sticky. The scraper tool also makes quick work of all of the little stray bits that are sure to be left behind. 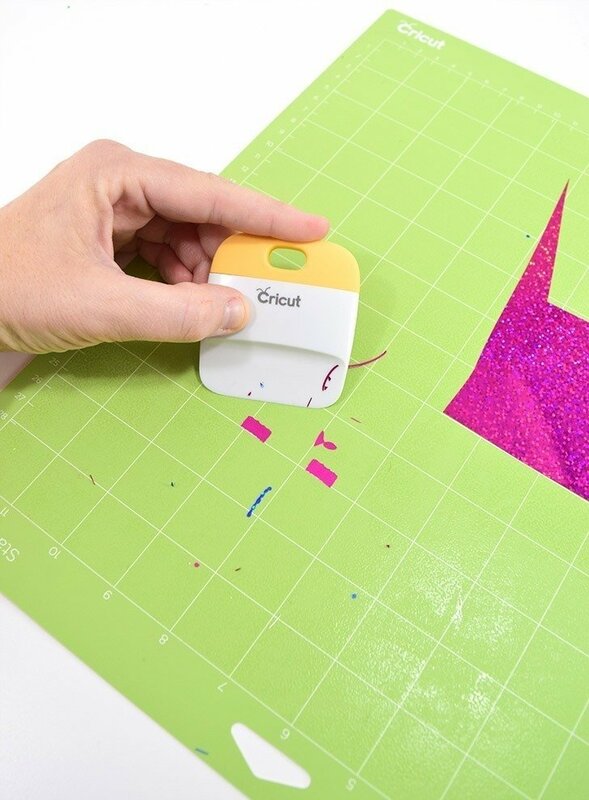 Simply swipe the tool along the surface and the little pieces will pop off. Oh, look! 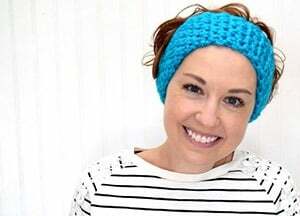 It’s a Carly! Oh, goodness, it’s an Ollie! 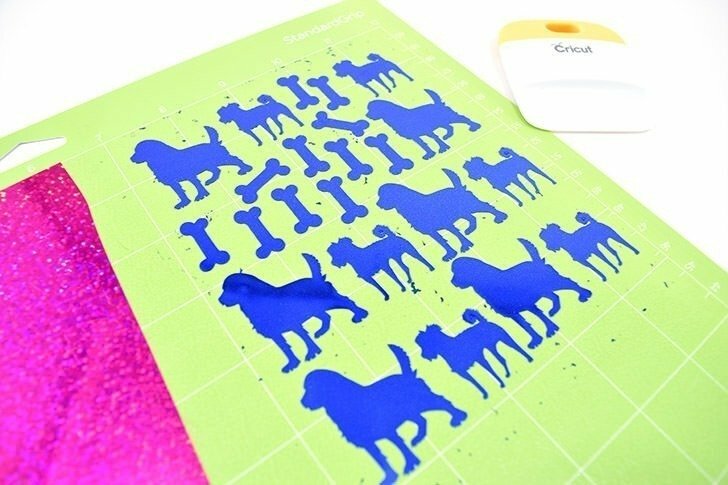 Now I cut a whole mess of Ollie and Carly dogs out of blue, orange, teal and hot pink Party Foil. I also cut a whole bunch of dog bones because they love their treats! I’ve got a huge pile in a little box with my greeting cards so I can confetti bomb the crap out of people. Huzzah! just a quick question, what thickness is the material and would I be able to cut it with a Cameo silhouette? 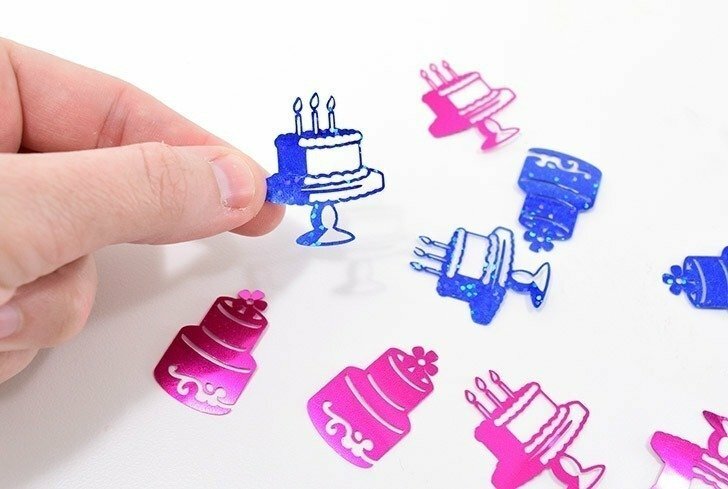 I’m afraid I cannot find info for the thickness online, but having just come from using Cameo, I can tell it’s totally cuttable with a Silhouette machine. I’ll update if I can find any more info on that thickness!